Hey guys, so it’s been a while (again) – the new year suddenly threw some curve balls my way, but one thing has not changed: Still fighting to be fit! I am training as usual, and although I had to take a break last month w/my coach because of financial issues, I am slowly working my way back up to normalcy. My goal is to be 100% back on track my March 1st, and I’m now shooting for an early June show, as opposed to April – giving me a couple of extra months to gain the necessary muscle I’m looking for, as well as make as many positive changes as I can. I’m really looking forward to seeing my progress since my last show! I’m stronger and more confident, something which I regard as really important when continuing to develop a good physique. A positive thing that has happened work-wise, is that my online training and diet services were launched, I’ve gained several clients and looking forward to working with all my clients this year in helping them achieve their dream body! If any of you are interested in learning more, let me know and we can communicate more in detail! This year, my focus will be on my job in the wine industry, teaching (about food and wine) as well as writing. I’m starting a new project with a friend of mine as well: I’m writing a cookbook about Norwegian food, and I’m really excited about this. I love being a freelancer, deciding how my day will look, and being able to almost schedule my work around my training, not the other way around. I’ve fought hard not to be a 9-5’er, something I was never quite that comfortable with (other than collecting that guaranteed check every 2 weeks – I miss that!). But my goal this year is also to continue to develop my health and fitness business, continuing to increase my online presence but also gaining more in-person clients. I’m re-certifying through NASM this year, and will take some continuing education courses, where my emphasis will be on sports nutrition and strength training. I would love to help others in their contest prep as well, something I feel I could be good at. I have developed a line of healthy foods through my catering company, Fork and Glass, which we are slowly starting to introduce around the various farmer’s markets we do weekly. Being your own boss requires to constantly find new ways to grow, which I find enormously satisfying, challenging and exhausting all at the same time. Ultimately, I want to incorporate fitness, food and wine into ONE and I will be launching a new blog soon that will be talking about how I manage to combine these very different and opposing interests. I’ve learned a very important lesson in the midst of my hardships so far this year: I may be struggling to find my “foothold” financially, but that does not mean I have to give up on training, eating right and being devoted to my health. After all, we’ve got nothing if not for a healthy body. It remains my #1 priority no matter how tough things can be. Is it hard to stay focused sometimes? I won’t lie – it definitely is. What is worse is feeling sluggish, tired, lazy and fat… on top of everything else! So no matter how crazy your day gets: find a few minutes every day to go to the gym, take a bike ride or go for a run… get out and push yourself, sweat and feel like you are living… it feels so great afterwards!! Thanks for the motivating words Sunny! I have had to take sometime off from training due to shoulder/clavicle issues. I have had issues with the middle part of my back so I am no stranger to pain or set backs however, I must admit I am not thrilled about this recent set back as I am not sure how long it will be before I will be training again. I like the above quote and thanks for the reminder, “Tough times don’t last. 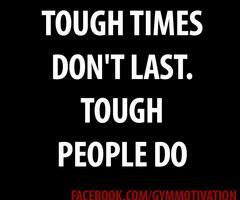 Tough people do!” Just what I needed! Good to hear from you Sally and you’re welcome – glad I can motivate the same way other fitness gals motivate me! I’m sorry to hear of your shoulder problems – that was me two years ago, I went to physical therapy twice a week and I still have some issues but it’s slowly getting better. Choose to look at this time as an excellent opportunity to work on your other body parts, perhaps get an extra bouncy tush?? 🙂 Careful not to work through the pain, the body gives you signals for a reason… Wishing you a speedy recovery and keep me posted on your progress! Hi fitbabe, thanks for visiting my page and for your comment! Combining wine and fitness is certainly hard, as is finding balance in life in general especially when you are seriously involved in either side. I believe it can be done, but just requires some extra determination and discipline! Good luck to you and I hope you’ll stop by my blog again soon! Cheers!